Made from military aircraft-grade aluminum and stainless steel, the stunning new Moto Z is durable-yet-razor thin - just 5.2mm - and ultra-light with a 5.5” Quad HD AMOLED display. The smartphone is equipped with a powerful Qualcomm® Snapdragons 820 processor, 4GB of RAM and 32 GB or 64 GB of storage inside. Those looking for even more storage for pictures, videos and apps can add a microSD card up to 2 TB. The smartphone comes with a water-repellant coating, which shields the phone from rain, splashes or spills that might come in its way. With the fingerprint reader, a touch is all it takes to instantly wake up the phone. Moto Z supports up to 30 hours of battery, so people can go all day and well into the night without needing to stop and recharge their phones. When in need, the Turbo Power™ Mod provides up to 8 hours of power in just 15 minutes. With Moto Mods, Lenovo has entered the next era of mobile technology. 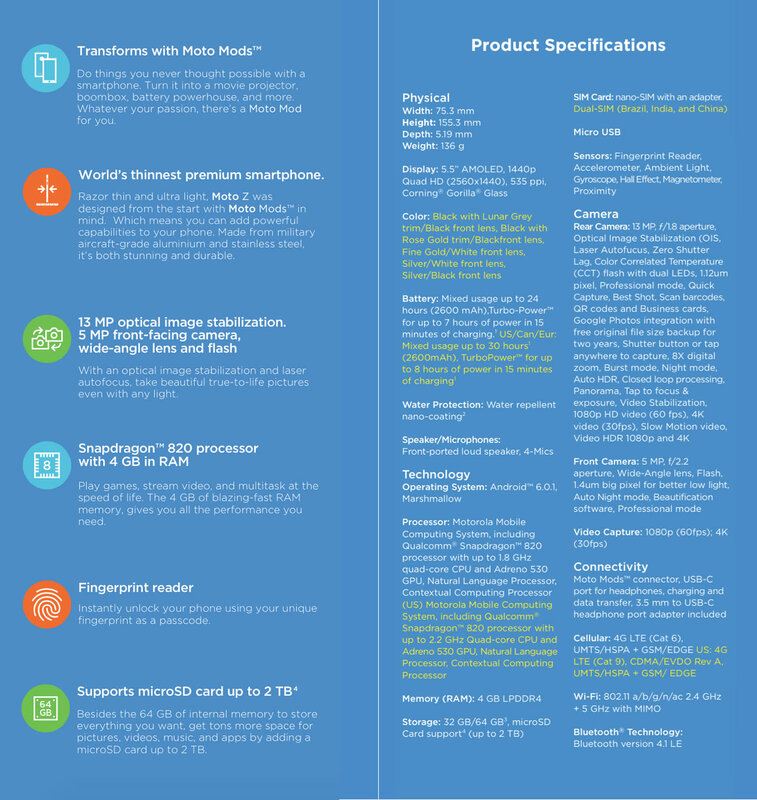 Consumers can transform their Moto smartphone into exactly what they need it to be, and the possibilities are endless. The Moto Mods Family includes the JBL Sound Boost speakers so users can take the party with them, the Insta-Share Projector so they can share content as and when they want, power packs from Incipio so consumers are never out of battery, and the Hasselblad True Zoom, that will enable aspiring photographers to capture precious moments on the go. 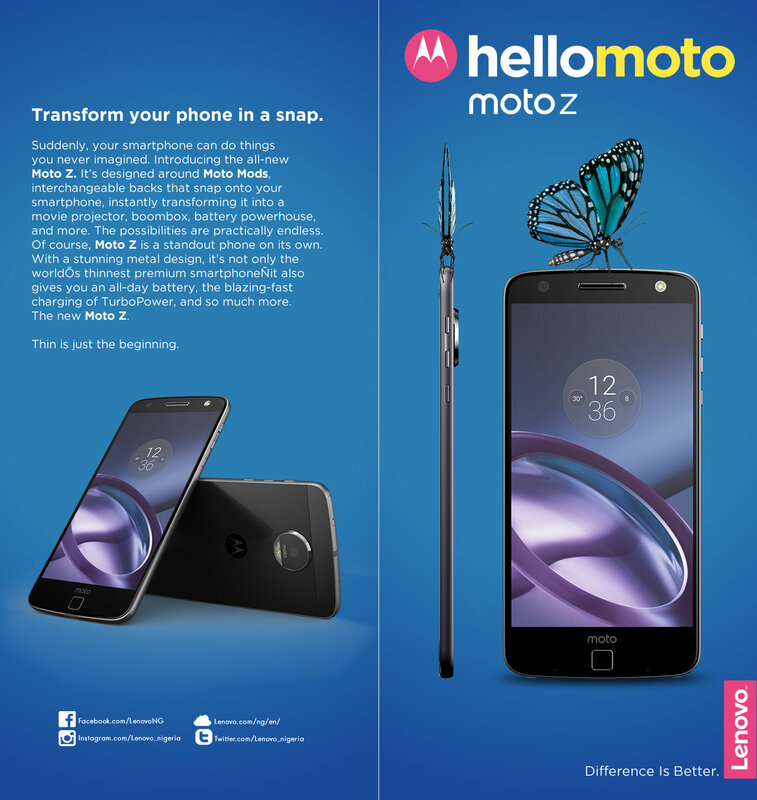 For Videos on the Moto Z and other Moto Smartphones: Moto Videos or Download the current advert in Nigeria: Video Ad in Nigeria. The Lenovo Moto Z Smartphone is currently retailing for #250,000 at the Lenovo Slot Brand Store on Medical Road, by Computer Village, Ikeja, All Slots Stores and Spar Shops in Lagos, Abuja and Portharcourt.